Hardly any sewing has been happening around my house recently. I had a 5 hour rehearsal on Saturday followed by a concert that took up most of Sunday afternoon. You'll notice that some goals didn't get accomplished this week. It's been a busy week! Ruthie 2 is doing really well. (See my last post if you want to see Ruthie 2!) I did spend some quality time with her yesterday morning. I was able to finish my first quilt on her. It's for Project Linus quilt from Faithful Circle Quilters up in Maryland. Before Sharon came down I asked the guild to send some quilts that needed to be quilted. I'll probably get one more done in the next few weeks and, I've got a customer quilt to do before December. So, I should be able to get some more time on Ruthie 2 soon. I'll keep you posted. Here's the quilt I took off Ruthie this weekend. The quilting design is African Samba quilted with So Fine thread but not sure the color or number other than beige. It has so much texture. Here's the goals from last week. I got some done but not all. And here's what's planned for the rest of this week. I'm linking up with my regular parties: Oh Scrap!, Monday Making, Main Crush Monday, and Moving It Forward. Take a few breaks this busy week to relax and get some inspiration. That's it for me tonight. It was a long rehearsal tonight. I'm heading for bed with a novel. And hope everyone enjoys their Thanksgiving day this year. Our kids have headed out of state this year so Pat and I are doing a really low key meal. When life happens, I just go with the flow. Maybe that's why I don't set goals most times. DS#2 was here from COC for 4 days to help celebrate DH's 80th. Not much sewing got done here either. PS - Cute baby quilt. 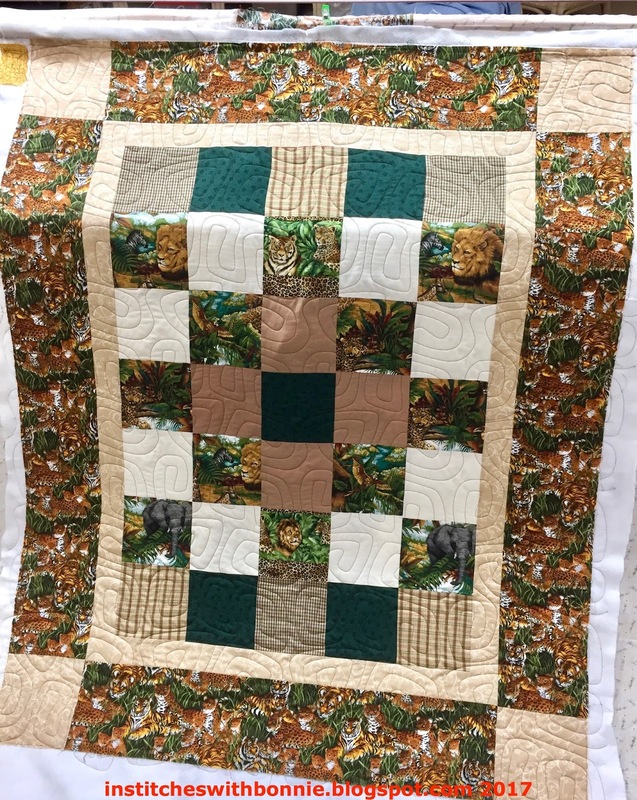 Very nice texture in the quilting. Congrats on finishing your first quilt on Ruthie 2. Hope all your concerts go well and you get some time to rest and stitch in between. Have a very Happy Thanksgiving. Ruthie2 did a great job on the quilt: the quilting design looks wonderful on that top. Enjoy your low key holiday, and I hope you and Ruthie2 have more opportunities to play this week. Have a wonderful Thanksgiving, Bonnie! Let Me Introduce . . .